119 registered members (addyguy, 53' Stude, 1978elcamino, ad244, 55hambone, 2010Civic, 7 invisible), 2,180 guests, and 24 spiders. So I am updating both of my daughters laptops and I seem to run into problems with both of them with "2018-03 Cumulative Update for Windows 10 version 1709 for x64 based systems (KB4089848)"
After the update I restart and get this message shown in the photo. Sorry for the quality. I reboot it a couple times and then can finally log onto the machine but then it will intermittently happen again. I have run the windows update trouble shooter then redownload the update then get the same results. I blocked a W10 update for about a year because most of the "apps" on our home PC would not work properly after the update. Finally went ahead with it and a slew of other patches a few months ago after the news of a big security hole that I believe was memory related that really had to be patched, things worked more or less OK after that. Have a few strange sound issues with some programs and games now, NBD. They list 3-4 options to try and fix the issue. dont download any software or automatic fix junk from that site. I just had an issue where the update broke hevc playback.. and the fix was to remove and reinstall a windows software "plugin" but it wouldnt reinstall "something went wrong on our end try again"
Edit: trav's link below is probably better to try first.. I didnt see that one in my google search. Edit: This may be the same thing Rand posted at the same time. Last edited by Trav; 03/23/18 08:57 AM. Google "Last Known good configuration". Follow the instructions to roll back your system files to a time prior to the update. Unplug the laptop then remove the battery. Put the battery back in and plug it back in. Worked for me with two laptops. Do a manual check for updates & check the update history. I've heard reports that notices such as yours are in fact incorrect and that the update was successful. Billy Gates better plan to filling his wallet. A good subject for another class action suit against him! Download and create a bootable USB drive of the Windows ISO from another Windows 10 computer (Compatable) following instructions from above site. Insert USB drive into the laptop and restart. As laptop starts up, select F12 (Boot Option) and ensure Windows boots from USB Drive. When Windows re boots, Follow the prompts for "System Recovery". In "System Recovery", select an earlier Restore Point (Date/Time).Most likely the point before the upgrade was downloaded. Follow instructions and when Windows re-starts it should function properly. **Disable "Automatic Windows Update" until Windows gets the bugs out of this version. Last edited by incognito_2u; 03/23/18 12:38 PM. Same thing happened to me. I was getting buffering issues and internet drop outs on both Edge and Chrome. Did a stats for nerds check on a HD youtube video and noticed the VP9 codec wasn't being used. Hence, there was definitely some hardware acceleration issues related with the creators update. I went directly to intels site and downloaded the latest graphics driver for HD630. Solved the problem. Also try plugging it in via ethernet and logging in. 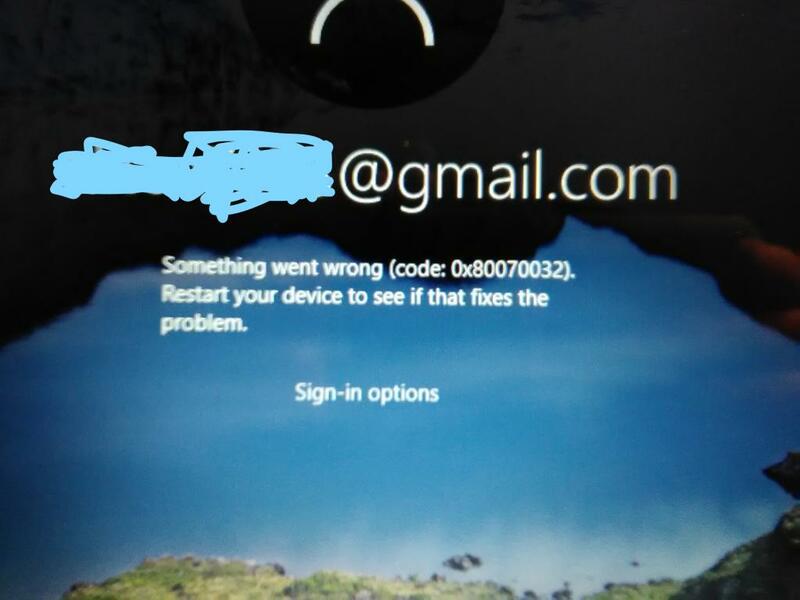 It seems like its having an issue verifying the gmail account. Create a local Admin account to use also that way if something ever does go wrong, you can still log in and use the PC. Thanks all, I'll work on this when I get home. It helped me to fix this problem. Now, my PC is working fine and i have no issue regarding this error.